E139AZ- Does this alpha numeric combination ring a bell in your mind? Congratulations if you knew what this postal code in the UK stood for. Yes folks, I’m talking about West Ham United, and with the weather being as cold as it is in the winter, is there not a better time to buy yourself a West Ham United scarf? Things are looking up at the Boleyn Ground, with Gianfranco Zola going about his job of engineering a revolution quietly. Yes, recession has affected us quite a bit, with the Icelandic banks going bust, but Zola is currently doing an excellent job with the resources available. 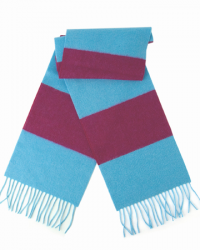 The scarf is an excellent accessory to accompany your favourite West Ham United shirt. In the 1920’s and before, there were no replica shirts made. A scarf was the only way by which you could determine the allegiance of a fan in the stadium, like it was in the final between Bolton Wanderers and West Ham in 1922 at Wembley. This West Ham United scarf is 100% cashmere wool. Do you know that US president Barack Obama also follows West Ham United? Keira Knightley, the British actress of Pride and Prejudice and Pirates of the Carribean fame, is also a West Ham fan. Steve Harris, Iron Maiden bassist, was once a youth team footballer for West Ham, and can still be seen sporting the crest on his bass. Buy your West Ham United scarf today from Savile Rogue.